I went to see another neurosurgeon today to get a second opinion regarding treatment for my shunt issues since July. He said the same thing my surgeon said in the sense that he doesn't question what another doctor does. He did mention if he were to do surgery he would change out the catheter which runs from my neck into my stomach. He also said he would've done an abdominal CT scan since I've been having so many issues in my abdomen and stomach. The only other option now is surgery and a new shunt valve to see if this resolves anything. Hopefully this means I won't be in pain again after next week as I expect to have surgery soon. I have a feeling I need a full shunt revision (where the entire shunt system valves, ventricular catheters, distal catheters are replaced) as I've been having pains in my stomach and abdomen which means the catheter in my stomach would need to be replaced too. Symptoms are getting worse. 2/17/14 – Sharp pains on shunt valve multiple times at 12:40am, 5:12am, 6:28am, 7:10am with sharp pains in top right corner of head and in stomach/lower abdomen. Over drainage in forehead and back of head with pain in lower abdomen at 7:14am. Pains in stomach at 7:40am with over drainage in forehead, pain on right side of neck behind ear. Sharp pains in back of head at 7:44am with cramping in stomach. Sharp pain multiple times on left distal catheter at 7:47am. Jerking underneath ‘93 revision scar at 7:48am. Sharp/throbbing pain on back of head at 7:50am, 7:52am ( with pain on top right corner of head). Sharp pains and throbbing in back of head at 7:54am with pain and throbbing on shunt valve at 7:55am. Over drainage in forehead, pain/throbbing in lower abdomen and stomach at 8:07am. Sharp pains/throbbing and pressure in back of head at 8:13am. Sharp pain on shunt valve multiple times at 8:14am-8:16am. Over drainage in forehead at 8:15am. Pains in lower abdomen near ’93 revision scar at 8:16am. Nausea t 8:17am. Sharp pain and tingling on shunt valve at 8:24am with nausea, cramping in lower abdomen ( 8:25am ) and over drainage in sides, back of head at 8:26am. Pains in lower abdomen and sharp pain on shunt valve at 8:35am with over drainage in back of head at 8:35am. Pain on shunt valve at 9:05am with over drainage in forehead, back of head, pains in abdomen. Tingling/numbness at top right corner of head at 9:12am with over drainage in forehead at 9:13am and aches in stomach. Sharp pain on shunt valve at 9:16am, over drainage in forehead at 9:22am, stomach pains 9:28am. Pain behind right ear, pains in stomach, over drainage in forehead at 10:12am. Sharp pains in stomach and on shunt valve and top right corner of head at 10:24am. Swelling in brain at 10:42am with upset stomach and sharp pain on shunt valve and top right corner of head. Pain in stomach at 11:03am. Pain on shunt valve at 11:07am. Over drainage and pain in forehead, back of head and sides of head starting at 1pm. Pain on shunt valve at 2:55pm. Pain continued into afternoon/evening hours with pains in stomach/abdomen/catheter clogging in stomach even after 8pm. 2/18/14 – Pain down right side of neck behind ear (multiple times) starting at 2am, 5:40am with pain on shunt valve and throbbing/pain in lower abdomen near ’93 revision scar and in stomach. Problems sleeping on right side all night with pains in back, sides of head. Over drainage at 6am. Pain down right side of neck behind ear with upset stomach at 6:26am. Sensitivity to touch on top of head on right side and left side (while washing hair) Pain behind right eye multiple times during morning hours starting around 2am, 5am, 6:27am with pain down right side of neck. Pains in stomach at 7:30am, 7:46am, 8:05am. Cramping pains/jerking movements in abdomen near ’93 revision scar at 9:24am with pain down right side of neck behind ear at 9:25am. Sharp pain on top right corner of head and sharp pain in stomach at 9:27am. Sharp pains on shunt valve (multiple times) at 9:30am with pain/numbness at top right corner of head and throbbing pains in lower abdomen at 9:31am. Pain/throbbing down right side of neck behind ear at 9:33am. Sharp pain on shunt valve multiple times at 9:35am with pain in back of head and over drainage in forehead and upset stomach at 9:36am. Pain behind right eye at 9:37am. Pains/burning in abdomen near ’93 revision scar and pain on shunt valve, near top right corner of head at 9:42am. Sharp pain on top right corner of head and on shunt valve at 10:03am with pain down right side of neck. Pain in stomach (vertical) at 10:06am. Pain in stomach, forehead and behind right ear at 10:18am with pain in top right corner of head. Pain/throbbing behind right ear at 10:47am-10:55am (multiple times) with pain in abdomen and in forehead. Sharp pain on shunt valve and around top right corner of head with nausea at 11:01am. Upset stomach, sharp/throbbing pain behind right ear on neck at 11:17am with pain in forehead and stomach, pain behind right eye. Pain on top right corner of head at 11:39am. Pain behind right ear on neck at 12:15pm with pain on top right corner of head and abdominal pain at 12:17pm. Sharp pain in stomach at 12:24pm with pain behind right ear on catheter at 12:25pm. Pain in lower abdomen near ’93 revision at 12:26pm with tingling/pain on shunt valve at 12:27pm. Over drainage in forehead at 12:30pm. Cramping in stomach (middle) at 12:32pm. Sharp pain/throbbing multiple times on top right corner of head at 12:33pm. Cramping in stomach at 12:38pm with pain on top right side corner of head. Pain throbbing down right side of neck behind ear at 12:41pm. Pain behind right eye at 12:43pm. Sharp/throbbing pains multiple times on top right corner and side of head at 12:50pm-12:51pm. Cramping in stomach at 1:02pm. Pain on top right corner of head at 1:09pm. Sharp pain/throbbing on top right corner of head (multiple times) at 1:21pm. Sharp pains in abdomen at 1:24pm. Pains in stomach at 1:45pm. Sharp pain on top right corner of head/right ear neck multiple times at 2:01pm, 2:05pm, 2:08pm, 2:12pm with pain in lower abdomen at 2:13pm. Pain on top right corner of head/behind right ear on neck at 2:15pm, 2:21pm ( with sharp pain in back of head ) and pain in lower abdomen. Since July 2013 I've been feeling vibrations inside my head, pain down the right side of my neck where my catheter is, pain in my abdomen and stomach, feeling the catheter clog in my stomach, four seizures ( in October and November ) which I haven't had since I was 3 months old before the shunt was placed, numbness in parts of my head, pain on the shunt valve and pain/throbbing in random places in my head, over drainage and csf pressure buildup in the back of my head and forehead ( this happened last Friday and has happened multiple times since July. He did say it could mean the shunt is clogged in one area, but they're not sure. He wants me to make an appointment to see him next week so we can discuss the matter again. Not sure yet if I want to do this. I could see the benefits of hearing more of what he has to say. I'm also not in the mood to visiting their office. It's obvious the shunt is over draining and I would need a new valve which is the only way to resolve some of these issues. The catheter in my stomach could also be dislodged and hasn't been replaced since 1993. I think I need it replaced, but they're hesitant to do this for the reasons mentioned above. I've been given all sorts of pain medication which does nothing to relieve my symptoms. I have no way of relieving the pain I feel. I'm going to try and get an appointment with another neurosurgeon to get their opinion. But how much longer? 2/3/14 – Sharp pain on shunt valve at 3:20am (multiple times), 6:30am (multiple times), 7:57am-8am, 8:34am (multiple times) with pain in stomach/abdomen simultaneously. Pain on shunt valve (multiple times) at 8:53am, overdrainage at 9:12am in forehead/back of head. Pain on top right corner of head at 10:16am, pain on left distal catheter at 10:22am (multiple times) with pain on shunt valve at 10:24am, 5:58pm. Pain behind right ear with pain on top right corner of head at 10:50am, pain on top right corner of head at 12:16pm, 12:48pm. Vibrations in back of head all afternoon. Sleeping too much. Vibrations in back of head at 6:05pm. 6:11pm, 6:25pm, 6:27pm with pain behind right ear. Pain on shunt valve at 6:34pm with nausea, pain in stomach. Nausea in stomach/pain at 6:57pm. 2/4/14 – Pain down right side of neck at 5:15am with pain on shunt valve and throbbing/pain in abdomen/stomach area. Sharp pain on shunt valve with pain in stomach at 5:41am, pain in abdomen at 7:15am, 8:30am (with pain on side of neck/shunt valve at 8:40am. Pain on shunt valve at 10:48am, 1:16pm (with pain down right side of neck). Pressure buildup in forehead with pain in abdomen near ’93 revision scar at 1:35pm. Pain on shunt valve at 2:21pm with pain in abdomen. Abdominal pains continued into evening hours every hour multiple times 3pm. 2/5/14 – Sharp pain on shunt valve multiple times with pain in stomach and right side of neck at 1:26am (with pain on left distal catheter multiple times) 4:11am, 8:04am. Pain on left distal catheter at 8:16am. Sharp pain on shunt valve at 9:15am, 9:30am (with pain on left distal catheter) pain on shunt valve at 11:34am (with pain down right side of head). Pain in stomach at 11:47am, pain on shunt valve at 11:54am, 12:05pm, 12:13pm. Vibrations inside head multiple times at 12:52pm. Pain down right side of neck on catheter at 3:39pm. Pain in stomach at 3:41pm. Pain on shunt valve at 3:59pm. Pain top right back corner of head at 4:27pm. Sharp pain near ’93 revision scar at 6:55pm. Pain on shunt valve at 7:14pm. 2/7/14 – Pain on shunt valve at 3:25am, 5:17am, 6am with pain in stomach and abdomen. Pain/vibrations in spinal cord during early morning hours while in bed around 5am. Pain down right side of neck at 5:30am. Pain on left distal catheter at 7:40pm, pain on shunt valve at 8:47am. Pain in stomach, abdomen around 10:06am. Vibrations inside head multiple times at 10:15am-10:16am. Pressure buildup in forehead at 10:36am with pain in back of head and stomach. Pain on shunt valve at 10:43am. Pain in lower abdomen at 10:47am. Pain on shunt valve and right corner of head 11:15am, 11:26am (with pressure in forehead) pain in back of head and pain on shunt valve again at 12:34pm, 12:36pm (multiple), 12:52pm. Pain down right side of neck on catheter behind ear at 12:53pm. Pressure in forehead at 1:06pm. Pain on shunt valve at 1:09pm, 1:13pm, 1:48pm (with pressure in forehead) Pain behind right eye at 1:57pm. 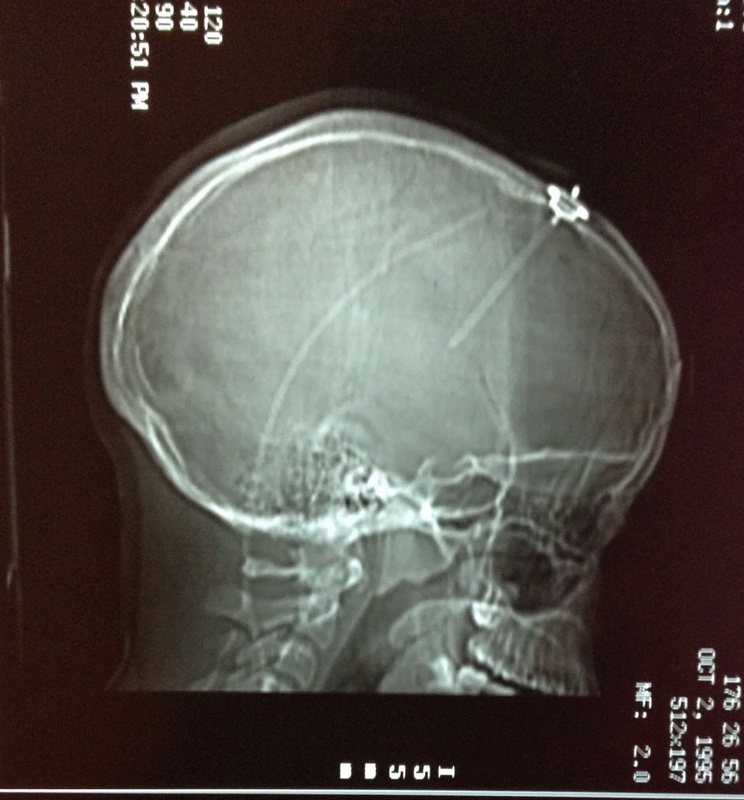 Pain in back of head and on left distal catheter at 3:01pm. Pain on shunt valve at 3:13pm. Pain on shunt valve multiple times between 5pm – 6:15pm, 7:26pm, 7:28pm with pain on top right corner of head and pressure down back of neck. Pain in top right corner of head at 7:34pm. The shunt didn't interrupt my ability to enjoy the movie and I don't allow it to interfere with my work during the daytime. I don't know what happened today, but it was the worst pain I've felt in week...which is why I'm going to bed tonight before 8pm. CT Scan of my shunt in 1995. Beginning: The patient presented with a few days of headaches. the patient had some nausea and vomiting. The patient came in the ER and a CT scan showed that ventricular system was enlarged compared to the previous rapid MRI done in 2010. The patient also had a shunt series which showed the shunt was intact. the patient had a shunt tap done and there was poor proximal flow seen. CSF was sent to the lab for routine glucose, cell count and gram stain culture. The patient was preoped and taken to the Operating Room for VP shunt revision. Middle: We planned to use two scalp incisions, one on the right and one to the left. We also planned to use the previous abdominal incision if necessary. We used a scapel blade to open the two incisions. The Bovie cautery was used to dissect down to the skull. The tissue was quite adherent and scarred. (from my previous revision surgeries) We therefore diagnosed a proximal shunt obstruction. We connected a new medium pressure valve to the distal catheter. The proximal ventricular catheter was removed. The new ventricular catheter was cut to the appropriate length so it could be connected to the new valve. It was secured with a 2-0 silk tie. End: 'We took a 25 guage needle and inserted it into the reservoir of the valve. We had good proximal flow. we then irrigated again with antibiotic irrigation. We closed the the two scalp incisions with a 2-0 Vicryl suture. We closed the skin with a 3-0 Moncryle. We placed antibiotic ointment and Tefla over the incisions. We placed Tegaderm over the Tefla. The patient was exuberated and taken to the PACU in stable condition. It's no wonder the throbbing pain I feel upon returning the hospital is so intense, since the incision made goes directly down to the bone. I had already known this before just based on the feeling of it, but to read about it is entirely different.